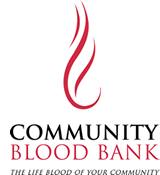 Thank you for considering donating blood with Community Blood Bank. Listed below are the general requirements for donating blood. Please provide personal photo identification, i.e. Driver’s License, State I.D. Card, Student I.D., Employee I.D., etc..
A donor must be at least 16 years of old age or older, (16 years must have a signed Parental Consent Form). A person must weight 110 lbs. Medications: A person can give if taking vitamins, birth control, or medications for allergies, blood pressure, thyroid replacement, female hormones, anxiety, high cholesterol, and most diabetes medications / injections as well as many other medications. Eating a good meal at least 4 hours prior to donating blood is highly recommended. Drink plenty of water or juice before and after donating. Avoid alcoholic beverages for 12 hours before and after donating. Shots: OK after allergy shots, influenza vaccination, or tetanus shot. Avoid strenuous activities for 4 hours after donating. Cancer: OK to donate after curative treatment for basal cell skin cancer and squamous cell skin cancer. OK to give five years after completion of all treatment (note exceptions below). Diabetics are OK to donate if controlled by medication or diet. Cold / Flu / Not feeling well and health; 72 hours symptom free. Deferred until feeling well and healthy. Pregnancy: OK to donate six weeks after end of pregnancy. Medications: A person cannot donate if currently taking antibiotics for treatment, or taking Accutane, Propecia, or Proscar. Ear Piercing: OK to donate, if performed with single-use device. If not, wait one year. Body Piercing: OK to donate, if performed in a South Dakota, Iowa, or Nebraska state-licensed facility. If not, wait one year. Hepatits B Vaccination: OK to give 28 days after vaccination. Tattoo: OK to donate, if performed at a licensed South Dakota, Iowa, or Nebraska facility otherwise wait on year from date of procedure. Last Blood Donation: 56 days between whole blood donations. Sixteen weeks between automated double red cell donations. Blood Transfusion or Tissue Transplant must wait one full year from the time of procedure. A person must wait one full year following travel to malaria risk areas as defined by the Center for Disease Control and Prevention (CDC). If person was resident in a malaria risk area, donor must wait three years upon entering the United States. Even if you are permanently disqualified form giving blood, there are other ways you can help support your community’s blood supply. You may: host a blood drive, volunteer, recruit friends and family members to donate blood. You can make the difference! If you have been diagnosed with AIDS / HIV infection or certain risk factors. Taken human growth hormone (HGH) injections (pituitary derived). Have had Viral Hepatitis at age 11 or older. Have had Melanoma, Lymphoma, Leukemia, or other blood cancers. If you have ever taken bovine (beef) insulin injections. Have spent (cumulative) more than three months in the United Kingdom between 1980 and 1996. Have spent (cumulative) more than five years in Europe from 1980 to the present. If the donor was a member of the U.S. military, a civilian military employee, or a dependent of a member of the U.S. military who spent a total time of 6 months or more associated with a military base in any of the following countries: Belgium, the Netherlands, Germany, United Kingdom between 1980 through 1990, or in Spain, Portugal, Turkey, Italy, or Greece, between 1980 – 1996. If you were a recipient of a blood transfusion in the U.K. and France since 1980. *Please note that Community Blood Bank staff member will make the final determination on eligibility prior to the blood donation.